Commercial property company Fawcett Mead has signed up for the Kick4Life All Stars Tour to Lesotho in November 2018. The tour will raise funds for Kick4Life's life-changing work with orphans and vulnerable children in the Mountain Kingdom. Co-founder of the company, Graham Fawcett (pictured left), will be joined by four members of the Fawcett Mead team. During the trip they will be trained to deliver health education & life-skills activities to children in local schools, directly contributing to the work of the charity. 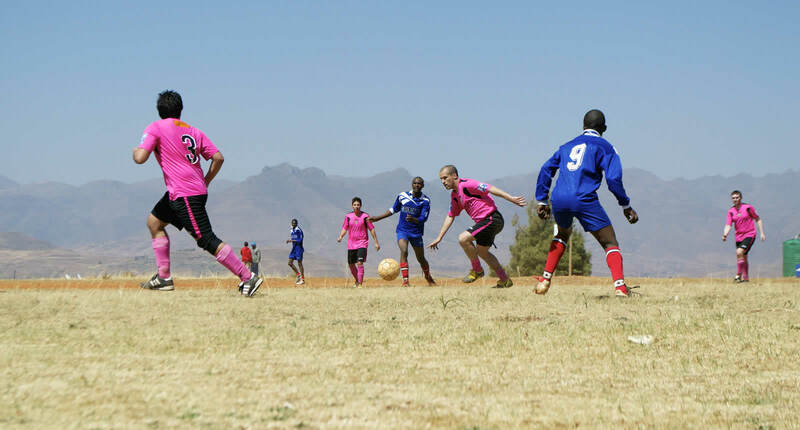 They will also have the chance to play football in front go hundreds of supporters, learn about the work of Kick4Life, visit range of cultural sites and see some of Lesotho's beautiful scenery with an adventure trip to the stunning mountain region. Fawcett said: "As a company we're committed to wider community development and we're thrilled to be linking up with Kick4Life to help transform the lives of some of the most disadvantaged children in the world. As sports fans, we're very excited by the opportunity to use football to make a difference." Also attending the tour will be representatives of Giggs & Co, a residential estate agency based in Fawcett's home town of St Neots. Fawcett added: "We're looking forward to linking up with Matt Giggs and his team at Giggs & Co on the tour and exploring how we can put our collective skills and experience to good use." Steve Fleming, Kick4Life Co-founder, said: "We're delighted to have Fawcett Mead involved in the tour. We've been running trips to Lesotho since 2007 and they provide a unique opportunity to experience the country, learn new skills, play football and directly support the work we do." Kick4Life has worked with more than 100,000 underprivileged children at their centre in the heart of Maseru, Lesotho's capital city. They have also set up a restaurant and a hotel that generate income for the charity as well as providing training and employment for young people. The charity has received multiple international accolades, including the Nelson Mandela Children's Award, has been funded by the likes of UNICEF, the Vodafone Foundation and BT Sport, and supported by Prince Harry and Fabio Capello. Alden Whittaker-Brown, a trustee of Kick4Life, attended a tour in 2014. He said: "It was simply an incredible experience. The tour was brilliantly organized and the chance to make a real difference was unforgettable. Lesotho is a beautiful and friendly country." To take part in the tour participants need to raise £2500. This covers flights, accommodation, meals and a wide range of activities, with the majority of the funds directly supporting the work of Kick4Life. The charity also provides support and advice to help people hit the target. The tour will run from November 23rd to December 2nd 2018. To join the tour please set up a fundraising page and pay the first £50 to secure your place. For more information contact Steve on steve@kick4life.org or call 07710 999 169.